'If you really think about it, if this was a business decision and I really made all that money that everyone was claiming that we made off this wedding, and if the wedding was fake and just for TV, I'm a smart businesswoman, I would have stayed married longer. Kelly Ripa - who recently signed a new five-year deal to stay with the show - has had a succession of guest hosts since Regis Philbin's departure in November. No full-time replacement has been appointed. The socialite - who filed for divorce from in October after just 72 days of marriage - has been seen constantly arguing with the basketball star during the current season of the reality show. 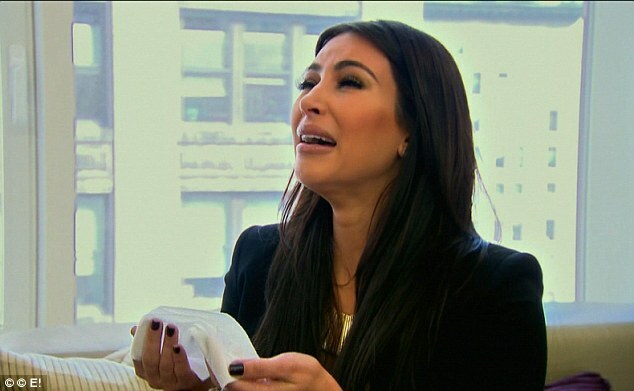 However, after watching an episode in which she confided in her older sister Kourtney that she knew her union with Kris needed to come to an end, Kim admitted the 'intense' scenes left her in tears. Following a meeting with medium John Edwards on the show, the brunette beauty told Kourtney: 'I don't want to be married anymore. Following her marriage split, Kim admitted while she is still a 'hopeless romantic', she needs to be 'a little more realistic' about relationships. She recently said: 'I'll always be a hopeless romantic. It means that I believe and love and the dream of having a perfect relationship, but my idea of it has changed.